The Gazco Marlborough small electric stove gives you the lovely effect of a relaxing realistic log-effect fire with none of the fuss. Add a warm, inviting element to your home's decor with this stunning small electric stove. The Gazco Marlborough small electric stove plugs into any 13amp socket. 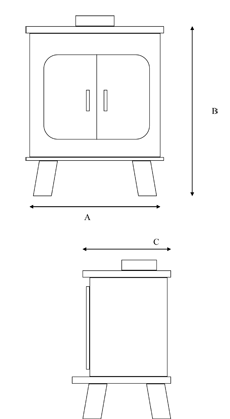 It is 99% efficient and is for use in any room without a chimney. 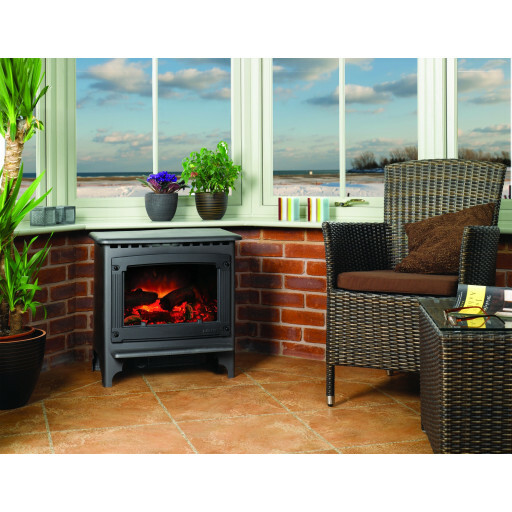 This stove makes a statement and is a perfect addition to a living room, study, conservatory, home office, or any small area that needs heat. The Gazco Marlborough small electric stove will elevate the look of any space with it's rich and solid design. Control heat and brightness settings with the touch of a button. Select from two heat settings for warmth and three levels of brightness to create just the right atmosphere in your living space. Get an additional choice for a blue-flame effect when you opt for the highest setting. You control the thermostatic setting manually from the stove. When you reach the perfect temperature, you can turn off the heat feature, sit back, and watch the calming flame-effects dance within the doors of this high-quality stove. The Matt Black finish fits in elegantly with any home's decor. The stylish design will update your room while providing extra heat when you need it. A good looking, solid stove. perfect for our conservatory. Not at all flimsy like some of its counterparts.